In a way, there’s less here than meets the eye. 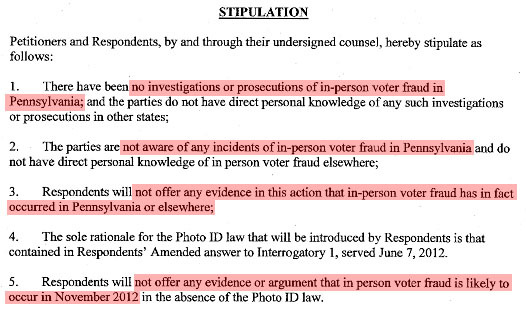 The state’s attorneys merely want to argue that the voter ID law is constitutional, and they probably think they can do this without any evidence of actual fraud. After all, in the Crawford case the Supreme Court upheld Indiana’s voter ID law even though the majority opinion conceded that “the record contains no evidence that  in-person voter impersonation at polling places has actually occurred in Indiana.” Pennsylvania’s lawyers probably figure this means they don’t need any evidence either, and as lawyers that’s all they care about. Still, it’s sort of a remarkably bald admission. The truth is that voter fraud is vanishingly rare in the United States, and in-person voter fraud is all but nonexistent. Everyone knows this, including the courts. That’s not why Republican legislatures pass these laws.